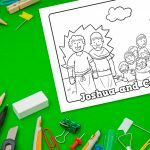 AIM: The childrens lesson on Joshua encourages children to see the benefits of having faith in God. We can learn to see bigger and step further in Him each day. Yet it helps them to see that faith also requires action – moving in line with what God has said. 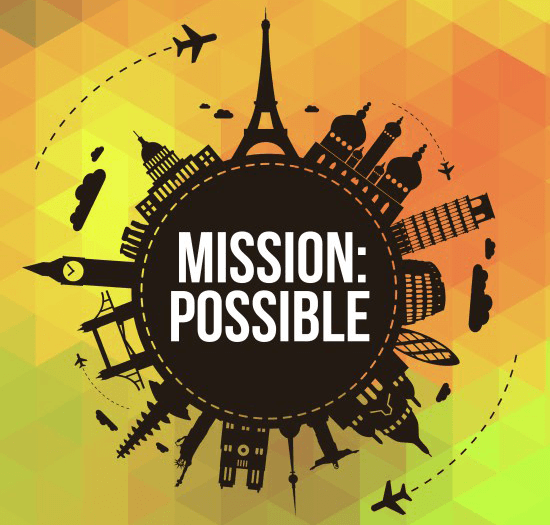 This lesson is the fourth in the Mission:Possible teaching series or VBS. 1. Egg Walk. Lay a plastic sheet down and choose volunteers to walk over it. Then lay some eggs down on the sheet and tell the children that they are to walk over the plastic but avoid the eggs. Blindfold the children and then remove the eggs. Watch as the children walk trying to avoid standing on the eggs. Time each player to see how long it takes them. The winner is the player that does the activity the fastest. Unveil the players eyes and show them that there were no eggs after all! 2. Faith Bag. Prepare a bag of items. Ask the children to put their hand in the bag and try and guess what the items are. Once they have guessed, they can bring the item out of the bag and reveal it to everyone. The player that guesses the most items correctly is the winner. Application: The children had to have a certain amount of faith to believe that what they were saying was correct, even when they could not see. Our faith however, is not built on guessing but is built on truth from God’s Word. 3. Face Match. Can your players match the face to the name without seeing the face first? Blindfold the children and then have some leaders walk in front of them. The first child to guess the leader by using their hands to feel around the leader’s face is the winner. You could play a few rounds to make it more interesting. BIG VERSE: We walk by faith and not by sight. 2 Corinthians 5:7. 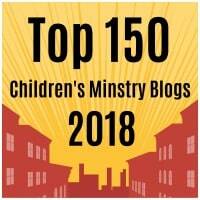 Read Numbers 13-14 yourself and pick out parts to share with the children. 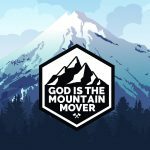 You could use this skit about Joshua going into the Promised Land or this video by Jelly Belly to communicate the story. The full Jelly Belly video is available to buy from any good Christian bookstore. 1) OBJECT LESSON: FAITH SEES BIG. You will need: Giant glasses and the “What Do You See?” drama. You will also need paper and tape for the person with word ‘FAITH’ on them and the person with word ‘SIGHT’ on them. Sight: I just see children. Faith: I see people that love God and that God loves. Faith: I see children of God; His masterpieces, missionaries going into their schools and telling people about Jesus. Sight: Really? Because all I see is a bunch of kids…. and some aren’t even paying attention. Faith: I see people that are learning to love God and others. I see people that God loves and is proud of. I see an army for God. Faith: Yes I am. I really am. I’m seeing what God sees. Say: Did you see how the two different people were looking at you guys? How did the person with the word ‘sight’ see you? Yeah, that’s right, they saw you as just kids. Sight is what is right in front of our eyes, what we see day to day. Yet faith is something much more special. What did the person with the word ‘faith’ see in you? That’s right, they saw who you were in God and what you could be in the future. Faith helps us to see what God sees. Even if we can’t see it with our sight. Faith helps us to see what is invisible; the good things God has planned and has told us. Faith isn’t just making up things, but it stands on what God has already said in His Word, the Bible. Even though people not agree, faith stands strong. 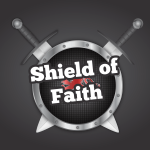 Which would you prefer to see through… eyes of faith or sight? Joshua saw with eyes of faith. Yet all the other spies saw only what was in front of their eyes, the giants. Yet Joshua saw that God had promised them the Promised Land. He had said they would walk into it and take it. 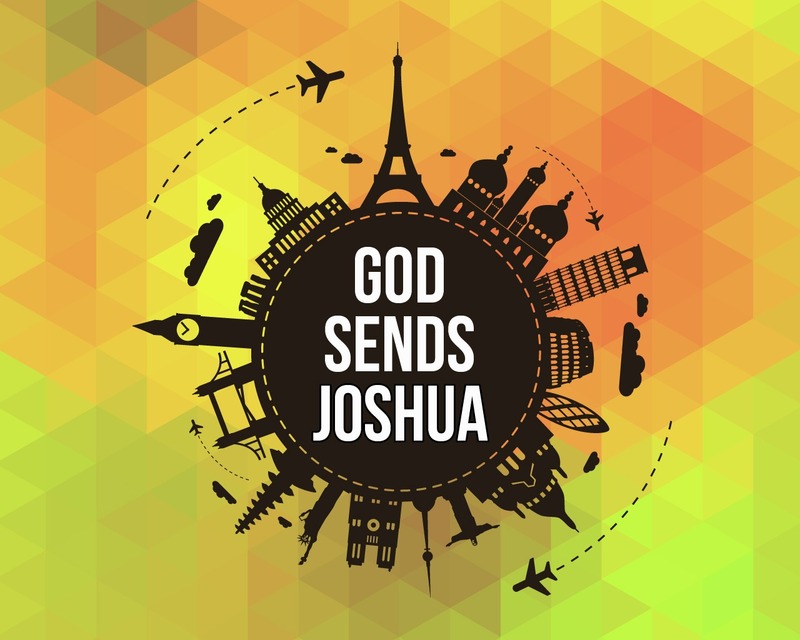 Joshua stood firm on what God had said. he saw with eyes of faith and didn’t focus on what his eyes saw. 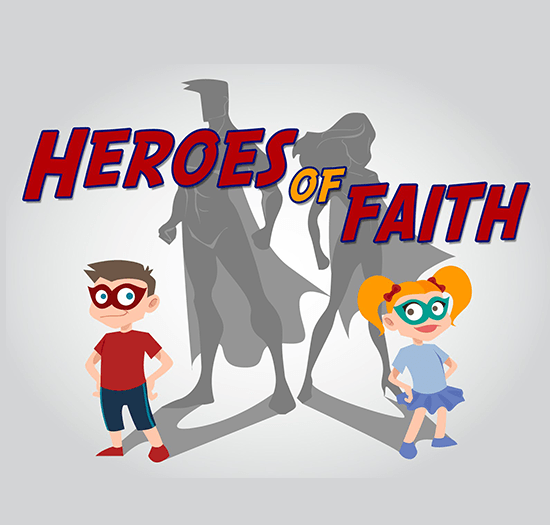 2) OBJECT LESSON: FAITH GOES TO WORK! Begin by reading or watching Blondin: Tightrope walker story and ask… out of all the people watching Blondin, who were the people that had faith. The Bible says that to each person is given a measure of faith (Romans 12:3). We all have faith. Even if we say we don’t believe in God, we have some faith. But maybe we don’t stand on what God has said but we prefer to put our faith in what others have said or in other things. Joshua could have been like everyone else and looked at the giants and believed what he saw. Yet he chose to use his faith. He chose to set his faith into action. 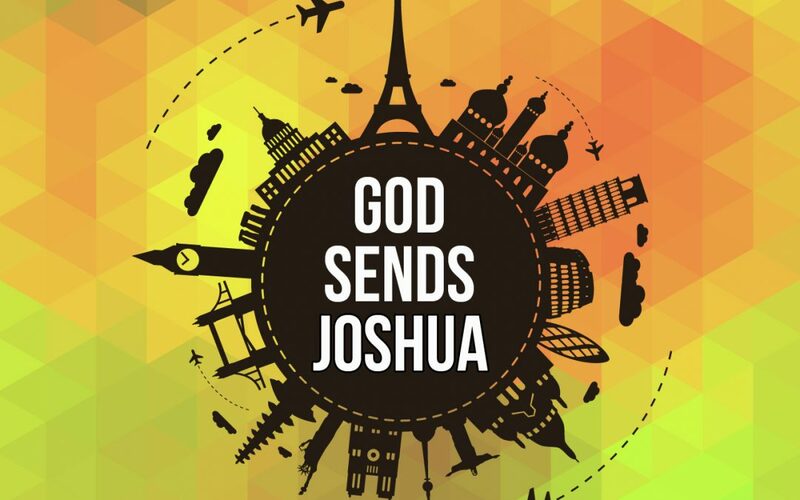 Joshua chose to stand on what God said. Jesus was exactly the same. He knew that many people didn’t love God or have faith in Him but he had faith that once day they would. Jesus knew how scary dying on the cross looked to everyone yet by faith He knew that God would bring salvation if he was give his perfect life. He knew that He had to live a perfect life and die a perfect death so that you and me by faith could know God once more. Are you setting your faith into action or are you just settling for believing what you see? You will need accessibility to the Indiana Jones clip found in the middle of this Leaps of Faith clip. When we start setting our faith into action we may find it pretty difficult at first. It might have been tough for Joshua to stand on his faith and say that one day they would get into the Promised Land… but maybe if he didn’t truly have faith and see through those eyes of faith, he may not have had boldness to make the next step… going through the Jordan River. Then there was the step of Jericho. Each time Joshua had to take a new step of faith. Just as Indiana had to step out Joshua had to step out in faith. Maybe God is asking you to step out in faith. maybe He wants you to tell others you are a Christian. Then your next step might be to tell others about Jesus. God might not give you all the steps at once, He will let you take little steps, until like Indiana, you will realize you have come a long long way! Once Indiana had made the first step it was much easier for him to keep stepping because he realized that he could trust the step and that it would hold him. It’s the same with us and God when we step out in a small way we realize that He is with us. It may be difficult but He has not left us, He holds us up even when things go wrong. He never leaves us. We can trust Him. That’s why it gets easier as we take little steps of faith. Children should be chosen as contestants to dive into the ball pool and find balls that have biblical characters on the balls. However, they must only find the characters that had faith. They may need help with some ideas. You can give them the answers to search for if needed. 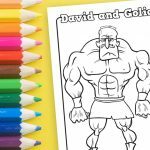 You will need: rolls of some kind (kitchen or toilet), paint or colored paper, glue or double sided sticky tape, scissors, colored shoelaces, glitter, stickers or sequins to decorate. 1. Cover the kitchen/toilet rolls in colored paper and tape down. 2. Glue or tape the two rolls together with double sided sticky tape. 3. Hole punch a hole into the tops of the two rolls. 4. Thread a shoe lace through both of the rolls so that it can be worn around the neck. 5. Decorate with sequins, glitter and stickers. As the children make their binoculars/ask children to think about how it feels to see through the eyes of faith rather than sight. My mission – to have faith in what God has promised. 1) Create a rainbow using paint and plain paper or using colored paper. Ask your children to write down things that God has promised them on post it notes. Provide them with Bibles if they need some ideas. Then pray together and thank God for all that He has provided and promised. Thank You that You are so good and that You are faithful. Thank You that You keep Your promises. Please help me to see through eyes of faith, even when everything around me looks hopeless. Help me to remember that You are much bigger than anything that I can see and that You are in control. Help me to live a life of faith in You.